Americans, Hondurans team to fix broken bones. 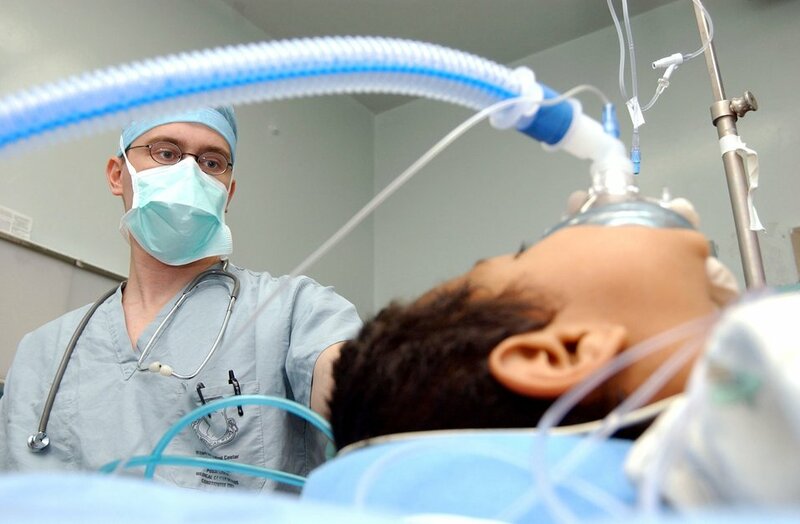 - Maj. (Dr.) Christopher James works to bring a 6-year-old Honduran boy out from under anesthesia after a successful surgery Aug. 15 at the Hospital Esquela in Tegucigalpa, Honduras. The procedure was accomplished as part of a pediatric orthopedic medical readiness training exercise. The boy was hit by a taxi cab causing an open fracture to his tibia. A medical team of eight people from Wilford Hall Medical Center at San Antonio and Joint Task Force-Bravo at Soto Cano Air Base, Honduras, treated more than 200 people and operated on more than 60 individuals during its two-week training exercise Aug. 5 to 19. Major James is an anesthesiologist at Wilford Hall Medical Center.